And yes it is a continual surprise to me what people pick as "favourite" photographs. I suppose professionals have a better understanding of what others are likely to appreciate. The viewer is always right as long as he does not want me to agree. OW: Your point about profs is on the money I think. Ian Battersby said something similar to me on the TGO forum. Something along the lines of "go with your emotion when taking shots for yourself but you need to take much more care when shooting (commercialy) for others"
Congratulations, a superb photograph! 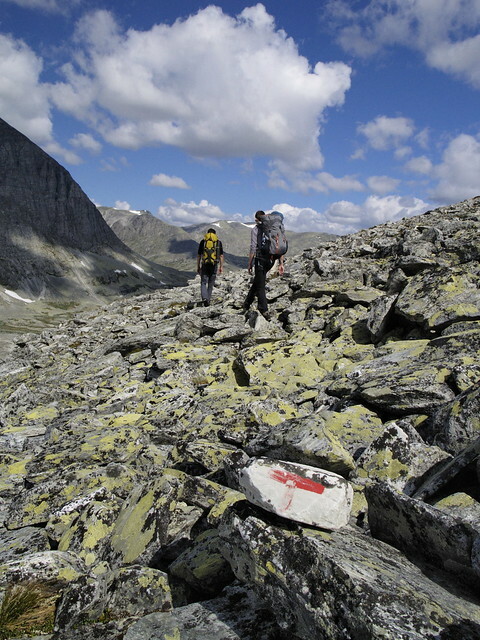 I like it a lot, a great photo of Rondane and your mates walking, makes one want to get away. I've been trying the new camera and what looks good, and also am always again what some people with more skills and knowledge pick as their favourites. I noticed the picture in oppad as well. At the first glance I thought: "hey, those rocks looks like the ones in Rondane" and then "I know these two guys!" Hendrik: Thanks. I find the Flickr community is great for feedback and is helping me look at my photos in a different way. Thim: Famous at last hey. Willem-Maartens first reaction was, "hey, looks nice there, looks like somewhere I should visit some day". I wonder what convinced the judge, my framing or your arse? What keeps me from Flickr is that you need to have a Yahoo account. I can't be bothered to go through that procedure, and am happy with Picasa and Photobucket for the time being. Hendrik: Sorry missed this. I can imagine your reluctance. I've lost count of how many user accounts, customer accounts etc etc I have on the go and am forever lossing passwords etc. I too use Picasa but Flickr is very different. It's much more of a community with much more exchange than I've experienced in Picasa. I realy think the exchange is helping me see my photos in a different light (excuse the pun).